The Oscars have the swag bags: Weddings have wedding welcome bags. Same idea. And since your wedding counts as your very own Oscars ceremony, only the best wedding welcome bags will do for your guests. So, just what is a wedding welcome bag? It is what it sounds like – a bag that you give your guests to welcome them – but it’s so much more, too. The modern wedding welcome bag allows couples to extend a personal touch to their guests as they arrive, even if the couple themselves can’t personally greet each person. In fact, as you’re creating your own wedding welcome bag, do keep that in mind. 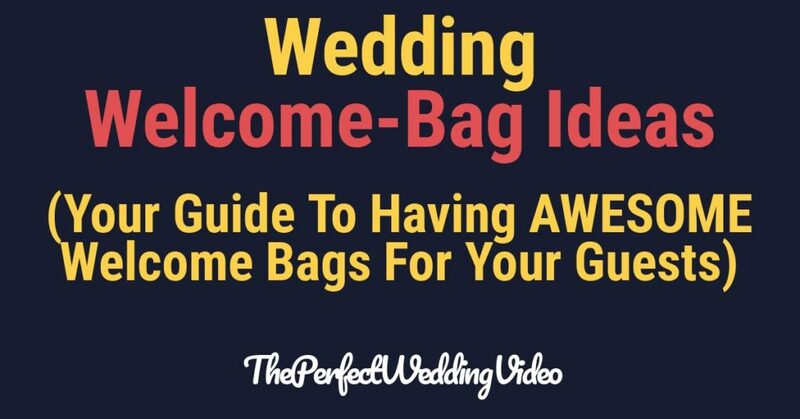 This bag is meant to provide a warm “Hello” to your guests as well as some useful goodies to help them navigate their way through the wedding process. These little gifts are exceptionally popular with people who hold destination weddings. However, they make perfect gifts for your guests no matter where you hold your nuptials. Although these little goodies samplers are call wedding welcome bags, savvy wedding planners and couples alike have extended the definition of this. As Town and Country Magazine points out, welcome bags are sweet, handmade baskets, decorative boxes, canvas totes, and many other types of containers. And there are some clever ways that some couples are taking advantage of the design of their welcome totes. For example, some couples have opted for personalized canvas totes, which guests can use to carry around their beach supplies or as grocery bags in the local market. The Knot suggests that couples put a few of their favorite items in their welcome bags. These could be a CD sampler of their favorite songs, a bar of gourmet chocolate from that little Swiss town where the two of you met, personalized crossword puzzles, and other signature items. Touches like these bring your guests into the spirit of the wedding and your new life together. If you include this sort of swag in your wedding bag, then do be sure to include a little note with each item to explain its significance. This solidifies the feeling of solidarity between you and your guests and offers a fun bit of trivia that guest can share during the reception. If you’re having a destination wedding, how do you get your guests on the same page, especially considering the fact that you can’t be everywhere and show them everything they need to know? The wedding paperwork is the key to solving this problem, according to InStyle Magazine. Include a wedding-weekend itinerary, helpful maps of fun things to do around town, important phone numbers and addresses, transportation information, and other info. Also be sure to tuck a hand-written thank-you note in the bag along with this. It sets the tone for the wedding and allows you to extend your thanks when you can’t do it in person until much later. Let’s face it. Just like it does at the Oscars, the champagne is gonna flow at your wedding. And champagne plus wine with dinners and cocktails, well, anytime mean only one thing…A hangover. So what’s a compassionate couple to do? Why, put some hangover remedies in the wedding welcome bag, of course. Include items like aspirin or another kind of painkiller, some bottled water, soda crackers, and coupons for a local restaurant that serves up plates of eggs, which are said to be excellent hangover remedies. Destination weddings give you a chance to really show off the place where you’re getting married. And the wedding tote is the perfect place for such a thing. From baubles and beads from Mardis Gras to Texas barbecue sauce, these types of gifts really highlight the attraction of place like few other souvenirs can. If you’re looking for possible ideas for local items, then check out souvenir shops, local arts and crafts fairs, and other items where local vendors tend to congregate. The wedding welcome bag has become a popular addition to many modern weddings. This bag functions as a greeting and a thank-you of sorts from the couple to their guests on the big day. Wedding welcome bags include items, like hangover cures, snacks, local items, and personalized information. They are intended to make guests feel welcome and offer a personal touch to any wedding, whether it be local or a destination wedding. And whilst you are now fully equipped to make all the right choices when designing your wedding welcome bags, you’re going to want to capture all of your excited guests expressions when they receive them, correct? If you are interested in having a wedding videographer capture all the beautiful moments and details of your wedding, then click to find out more about what we can do for you!